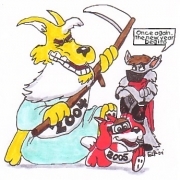 It's a drawing of me as Old Woldman Time chasing RedStreak as the New Year Cub who stole my glasses. Commenting on this act is Ninja Wolf who is watching this from a safe distance. 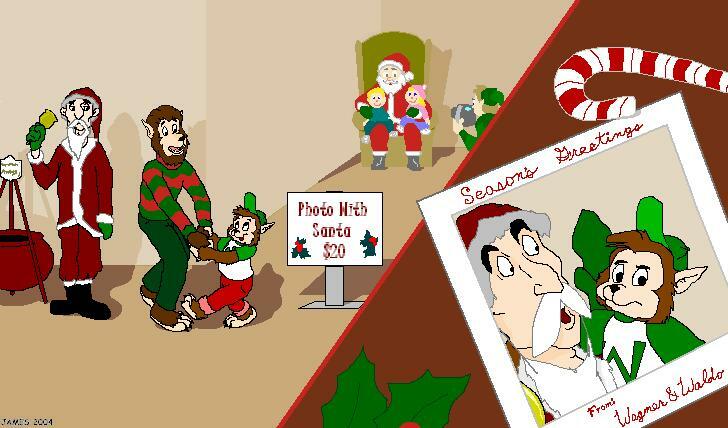 This was the Christmas card that I created for The Cadre Corner earlier this month. I know it's a little late but it's not the new year yet either. I just wanted give everyone a chance to see it. Welcome to The Werewolf Café's 11th full moon! Thank you for stopping by and visiting during this full moon phase! This month's full moon is called the "Full Cold Moon" or the "Full Long Nights Moon." During this time the winter cold takes hold, and the nights are at their longest. The shortest day of the year was December 21st, the day of the Winter Solstice, so the days are beginning to get longer now. An interesting fact is the Moon is above the horizon for a longer time now, because it has a high trajectory across the sky (opposite a low Sun). This full moon is sometimes called the "Moon Before Yule." 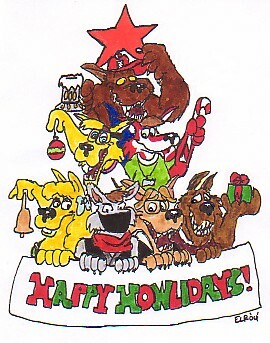 The Werewolf Café wishes you and your families Happy Holidays (around here we say "Happy HOWL-idays"). Happy New Year! If you are new to this website, we wanted to let you know that this site is only open during a full moon phase, so when the moon is looking full, this website is open. As the moon begins to look less full, this website closes down again until the next full moon phase, but the forums here remain open everyday. The Werewolf Café will be celebrating its "First Birthday" during the March full moon phase. If you would like to email something in for that event, you can send in it anytime from now until one week before the March full moon. Please send all "First Birthday" emails to fullmoon@werewolfcafe.com and please type "First Birthday" in the "subject" field of your email. "Thank you" in advance to anyone who will be sending something in, please help us make this March full moon event a special one. C. T. Adams and Cathy Clamp's new book titled "Hunter's Moon" is out. Cathy and Cie are both forum members here, and there is a forum for the "Hunter's Moon" book (as well as a forum for their sequel book titled "Moon's Web" which will be out in August 2005), so please feel free to check that out. If you go to Cathy and Cie's website you can read two chapters of their book "Hunter's Moon," and if you check out the forums here, you can read the first chapter of their sequel book "Moon's Web" before its release date in August 2005. Exciting news! Wes Craven has a werewolf movie coming out in theaters on February 25, 2005 called "Cursed," so be on the lookout for that one (you can read more about this movie in the forums on this site). While fliping through the menus, you will notice that you can only see postings from the last 3 or 4 months. All menu postings older than that can be found by using the "archive panel" on the left hand side of each menu. All postings (old and new) are archived by month. If an article ends with a "[+/-]" icon on the bootom left side of an article, you can click on that icon and the article will expand out to show you the rest of the article. Some articles are very long and the Admin tried to shorten them so they wouldn't take up a whole page (you will mainly only see this icon on the "Stories" menu). If you would like to leave a comment on one of the articles posted here, you can do so by clicking on The comment icon on the bottom right hand corner of each article (some of the artists and writers here would really like to hear feedback from you). If you would like to leave a quick or general comment about the site, please sign The Werewolf Cafe guest book before you leave today, thank you! If you are a writer, an artist, a poet, or someone who just wants to post something cool or fun that's werewolf related on this site for a future full moon, just email it on in along with a greeting, any weblinks and/or anything else you want to say to the Admin at fullmoon@werewolfcafe.com at anytime.